Morgan Stanley's Katy Huberty suspects that a comprehensive media bundle including Apple's video offering and a rumored News subscription service will continue to drive Services forward, and return the company to a $1 trillion valuation. 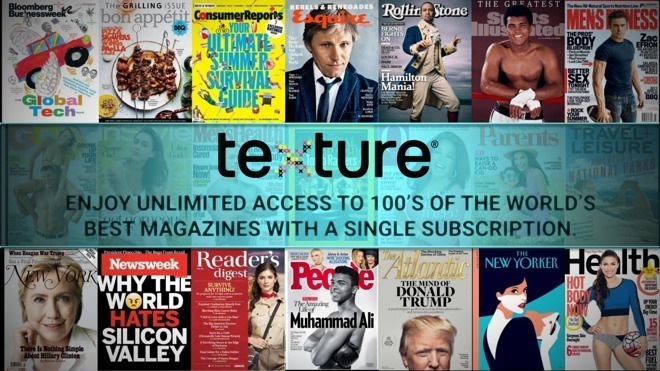 In a note seen by AppleInsider, Huberty expects that Apple will introduce a "media bundle," including video, Apple Music and a renovated News app including what is presently offered in the Texture magazine subscription service. Huberty believes that it will drive 5 percent revenue growth, and 12 percent earnings per share annually through 2023. Huberty also expects that the iPhone will return to growth shortly, as highlighted in the earnings call. Apple briefly commented on January's sales figures, and the company took steps to assist demand in some markets by altering iPhone prices so that they are closer to U.S. valuation of the devices. "iPhone replacement cycles now stand at mature levels suggesting a stabilization of growth is in the cards over the next year," wrote Huberty of Apple CEO Tim Cook's remarks. "Management's commentary that demand improved in January is similarly encouraging." The stock buyback program is also expected to continue, with Huberty predicting an expansion of the program. Huberty is expecting to see a "more active buyback program." This, coupled with a better understanding of "the stabilization path for iPhone and impact of new services" will also help to drive Apple's valuation back up to $1 trillion. The most recent note from Morgan Stanley isn't Huberty's first remark about Apple's services business. Most recently, Huberty in November predicted much the same, emphasizing that Apple's course to growth in a contracting global hardware market is in services. Apple's "more engaged iOS user base and broadening portfolio of Services," versus its competitors makes Huberty confident that Apple will sustain 20 percent annual growth over the next five years overall, supported by Services. Huberty still expects $101 billion in Services revenue alone in calendar year 2023 -- a marked increase from the fiscal year 2018 revenue of $37.2 billion. For comparison, in fiscal year 2018, Apple sold $112 billion in iPhone hardware in the U.S. alone. Over the last six quarters, the firm has accurately predicted Apple's Services revenue growth, doing so with far more precision that counterparts. On the other hand, Rosenblatt and Merrill Lynch have under-estimated Services revenue for the last several quarters. If you can't see your comment, take a minute and re-read the commenting guidelines. More spitballing by analysts that know nothing. Funny how after analysts spent so much time and effort talking AAPL down because of iPhone prices and the slowdown in China suddenly they are talking AAPL up because of services. Today it’s a seesaw battle between AAPL, MSFT, GOOGL, and AMZM for the market cap crown. AAPL is coming back with a vengeance. And this is not manipulation? Kate Huberty is 100% right on point. This has been something I have been pushing for years. Why would anybody describe this as manipulation or spitballing? It’s one of the more respected and intelligent ideas out there, especially when compared to the slew of no-nothing rants we read all the time from Apple haters. It's logical for Apple to make certain bundles that would be inclusive of similar services. Having a magnitude of little individual services is a surefire way of having stunting growth in weaker services. E.g. If magazine access is bundled with film/series as a "media bundle", then I'd be much more likely to get that service. Because I don't consume enough of either format individually to justify a solo subscription for either, but together: absolutely. The same can apply to games and music. Games provide a differentiator to services like Spotify which won't be able to provide a similar bundle, so it'd be a great way to make a lot of people switch to Apple Music from other music services. I think apple could make an all-access bundle, but that would require a lot of tricky back work to divide up the subscription fees to the relevant content providers. It could also stunt the ability to introduce new services or expand existing ones.